"So fast and easy to prepare, these shrimp are destined to be the hit of any barbeque. And, weather not permitting, they work great under the broiler, too." In a small bowl, crush the garlic with the salt. Mix in cayenne pepper and paprika, and then stir in olive oil and lemon juice to form a paste. 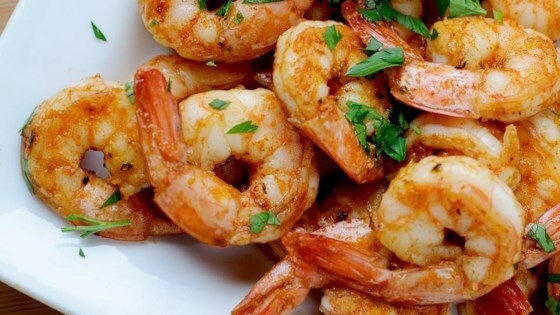 In a large bowl, toss shrimp with garlic paste until evenly coated. Lightly oil grill grate. Cook shrimp for 2 to 3 minutes per side, or until opaque. Transfer to a serving dish, garnish with lemon wedges, and serve. If you don't have coarse kosher salt, use 1 teaspoon table salt instead. It may be because I left the shrimp in the sauce for around 20 minutes before cooking, but these were way too salty. (And I love salty food.) I love the rest of the flavors, though. Great flavor. I cut down the salt to 1 tsp. and added 1 tsp. of Old Bay Seasoning (because I can't imaging shrimp without it). Make sure you don't overcook! I used less salt and more cayenne. I then prepared 2 batches - I wrapped half the shrimp in bacon before I skewered them. Both were good, but the bacon wrapped were THE hit! i made this yesterday and today because i LOVED it sooo much. i put the shrimp on top of mixed greens. yum!!! great recipe!